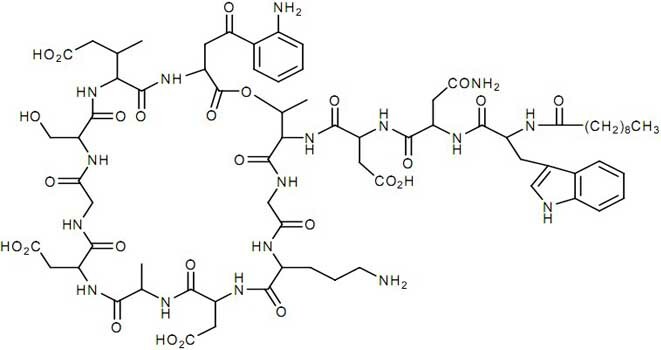 Cubicin is an antibiotic that fights bacteria in the body. Cubicin is used to treat bacterial infections of the skin and underlying tissues. Cubicin may also be used for other purposes not listed in this medication guide. What is the most important information I should know about Cubicin? Before using Cubicin, tell your doctor if you are taking a blood thinner or a cholesterol-lowering medication. Cubicin is given as an injection into a vein. You may be given instructions on how to use your injections at home. Do not use this medicine at home if you do not fully understand how to give the injection and properly dispose of needles and other items used in giving the medicine. Use Cubicin for the entire length of time prescribed by your doctor. Your symptoms may get better before the infection is completely treated. Cubicin will not treat a viral infection such as the common cold or flu. Call your doctor at once if you have any numbness or tingling, or any unusual muscle pain, tenderness, or weakness. To be sure Cubicin is helping your condition, your blood will need to be tested on a regular basis. Your kidney function may also need to be tested. Do not miss any scheduled appointments. What should I discuss with my healthcare provider before using Cubicin? Do not use Cubicin if you are allergic to daptomycin. a nerve or muscle disorder. If you have any of these conditions, you may need a dose adjustment or special tests to safely use Cubicin. FDA pregnancy category B. Cubicin is not expected to be harmful to an unborn baby. Tell your doctor if you are pregnant or plan to become pregnant during treatment. It is not known whether Cubicin passes into breast milk or if it could harm a nursing baby. Do not use this medication without telling your doctor if you are breast-feeding a baby. This medicine should not be used in a child younger than 18 years old. How should I use Cubicin? Cubicin is given as an injection through a needle placed into a vein. Your doctor, nurse, or other healthcare provider will give you this injection. The medicine must be given slowly through an IV infusion, and can take up to 30 minutes to complete. Cubicin is usually given every 24 hours for 1 to 2 weeks. Follow your doctor's instructions. You may be shown how to use your medicine at home. Do not self-inject this medicine if you do not fully understand how to give the injection and properly dispose of needles, IV tubing, and other items used in giving the medicine. Use Cubicin for the entire length of time prescribed by your doctor. Your symptoms may get better before the infection is completely treated. Cubicin will not treat a viral infection such as the common cold or flu. To be sure Cubicin is helping your condition, your blood will need to be tested on a regular basis. Your kidney function may also need to be tested. Do not miss any scheduled visits to your doctor. This medication can cause you to have unusual results with certain medical tests. Tell any doctor who treats you that you are using Cubicin. Cubicin must be stored in a refrigerator and kept from freezing. Each vial (bottle) of this medicine is for one use only. Call your doctor if you miss a dose of this medicine. Seek emergency medical attention if you think you have received too much of this medicine. Symptoms of a Cubicin overdose are not known. What should I avoid while using Cubicin? What other drugs will affect Cubicin? cholesterol-lowering medicines such as lovastatin (Mevacor), simvastatin (Zocor), pravastatin (Pravachol), fluvastatin (Lescol), atorvastatin (Lipitor), or cerivastatin (Baycol). This list is not complete and there may be other drugs that can interact with Cubicin. Tell your doctor about all the prescription and over-the-counter medications you use. This includes vitamins, minerals, herbal products, and drugs prescribed by other doctors. Do not start using a new medication without telling your doctor. Your pharmacist can provide more information about Cubicin.